Like many spiritual gurus, Byron Katie seems to mix truth and lies, help and harm, wisdom and blindness. In the three previous articles, I dished out a lot of heartfelt praise and a lot of pretty harsh criticism as well. In this article I compile everything from the previous articles into one list. This includes everything Byron Katie is doing that truly helps people, as well as all the things that could potentially harm people. I also try to identify the psychological mechanisms by which the help and harm take place. Perhaps this comprehensive analysis can give us some insights into how guru type personalities operate. Gurus are usually neither 100% helpful nor 100% harmful and I would like to paint this picture using all the shades of gray that exist rather than either black or white (which is tempting). I’m really trying to be fair. After all, every guru is an imperfect human just like the rest of us. The Work appears to be an effective tool for developing mental flexibility. It provides mental exercises for understanding and changing one’s filters or ways of perceiving reality. The Work appears to have the potential to help some people be present in the moment. The Work appears to have the potential for helping some people be more at peace with themselves and their life. The “turn around” is a helpful mechanism, with reservations. It is good for understanding and resolving the ego-defense mechanism of projection and developing mental flexibility. The “turn around” is also helpful for taking personal responsibility for one’s own contributions to a situation. Having said that, it is important not to take them literally, because turn-arounds can be technically false. They should be used to stretch one’s mind, as doorways to entertain new possibilities of thought and perception, but not taken literally. In the case of those with trauma history, if the turn-around is taken literally it could be re-traumatizing. The “I look forward to…(something I have been dreading)” is also helpful for overcoming fear, increasing mental flexibility and overcoming duality but it’s important not to take completely literally. The Work can be empowering and freeing by teaching us we are not at the effect of our thoughts. Doing inquiry shifts the power into our hands, and we discover we can take control of our thoughts and emotions. The Work can help point the way to an experience of having. This means that through the process of inquiry we can identify what we are longing for and consciously bring it into our experience via the imagination. Byron Katie does not have formal training in psychology which means she could lack the ability to address individuals with mental illnesses, or to perceive when something psychological is occurring for someone during the Work that someone with training would recognize as compromising. Some people may take the message to “love what is” in a way that is disempowering and undermines or stagnates the development of willpower. The Work confuses liberating stories and harmful beliefs. No methods exist in the Work for isolating harmful beliefs from other types of communication. Not distinguishing between a liberating story and a harmful belief can cause a kind of cognitive dissonance among other problems. Inquiry done on liberating stories could invalidate the personal truth which is especially problematic for those with a trauma history. Re-traumatization can occur due to this invalidation. Questioning method could increase dissociative tendencies in those vulnerable. Questioning method could increase self-doubt in those vulnerable. Questioning method with a trauma survivor could prevent them from developing the ability to be their own resource, by teaching them to invalidate their thoughts. Questioning method could make it hard for a trauma victim to build inner strength needed to overcome PTSD and avoid future trauma. Blame the victim could result from some aspects of The Work. There appears to be little to no understanding of the special needs of people with mental illnesses . For example for PTSD, inquiry should only be done after all the trauma-related issues have been processed to a level such that the person is able to reach and maintain inner stability reliably. This requirement of inner stability is not addressed. The Work does not clarify the goal of the turn-around which is to overcome duality and develop mental flexibility. The Work does not specify that the turn-around is not supposed to be taken literally as self-blame (blame the victim). The turn-around could re-victimize if taken literally in cases of trauma victims. The Work does not appear to address practical problems; The Work doesn’t appear to promote healthy solutions to human problems, solutions that increase overall life satisfaction and health. The lack of focus on helping people make external life changes may increase learned helplessness and stagnate development of personal will. The Work doesn’t appear to be realistic about the true nature of needs the average human has at this time, many times it does not represent an appropriate way to address our realistic needs in life. The Work doesn’t appear to address us where we are at, rather it tries to pull us up to a kind of enlightened state. For some this is helpful but for others that is not helpful and people should be given a clear choice. The Work appears to be irresponsible to people in trouble by encouraging them to accept their situation, and encouraging them to blame themselves. The Work appears to lack humanness, natural feelings of empathy and compassion. The Work appears to lack respect for the actual cause and effect relationship we have with one another (aka karma). The Work may not acknowledge the fact that we do influence each other. This human interconnection is normal because we are social beings. Byron Katie may behave like a one way street, not trying to learn from her students as peers, showing a lack of equality. Byron Katie may not see others fully for their gifts, brilliance, skills, struggles, fullness of personality, as entire universes of potential. This may not help people to feel fully seen. The Work appears to ignore the facts of human development, and the discoveries of developmental psychology that pertain to human growth, and this may result in people not being seen for their needs in terms of unfinished human developmental stages. Ignoring this can cause problems when people try to substitute spiritual development for human development. The Work appears to lack a scientific approach, meaning it does not appear to want to use the laws of science to verify its effectiveness, and to put it on an equal standing with all other areas of scientific inquiry. The Work expects Nonattachment, however it might be more realistic to use Preferences. One can turn harmful beliefs (demands) into rational beliefs (preferences) or one can try to let go of our attachments 100% (and have no preference about anything). For most of us it is unrealistic and not desirable to let go of attachments 100%, thus it can be helpful to use the word “prefer” to express a healthy position in relation to the matter at hand, however, one is certainly free to explore nonattachment if it benefits one. The Work does not point out that you have an option here, and that you should use your free will to decide which will be most beneficial to you. There is a lack of focus on somatic processing , body intelligence. This is a big deficit especially for anyone who has suffered trauma because some trauma recovery is only accessible via the body sensations and memories. Surface beliefs are not distinguished from core beliefs. Some therapies have techniques for finding core beliefs rather than doing inquiry on any kind of statement that comes up. There does not appear to be an understanding the big picture in which The Work takes place. Only working with thoughts leaves out a huge amount of the experience of being human and the whole “project” of healing and growing some aspect of oneself that includes a multitude of variables. Glamour is used, for example, creating a guru-like format and making it a spiritual thing not just cognitive psychology (science). Guru worship. Katie does not actively prevent guru worship within her followers. Guru worship is an ailment, and it is a mechanism that serves to blind people from critical thought. A certain percent of the time the group seems to display unquestioning commitment to its leader. A lack of promotion of confrontation and questioning of the group is not healthy. Some online comments indicate questioning, doubt, and dissent are discouraged in the context of the 9 day workshop, either outwardly or by a collective unconscious agreement. Possibly, mind-altering practices are encouraged, for example fasting for 3 days. In some comments online there are suggestions to the effect that the group teaches or implies that its supposedly exalted ends justify whatever means it deems necessary. For example, some people who attend the 9 day workshops may feel like they need to conform to the long days of inquiry and various other things (no makeup, eating in silence, dietary changes, fasting, spending the day in Los Angeles pretending to be homeless, etc.) in order to reach the “Truth” or to obtain something else. To some degree, the group is preoccupied with making money. Byron Katie charges an exorbitant amount for the 9 day workshops. OK, so we have 12 potentially positive, helpful aspects of The Work and 37 potentially negative, harmful ones. Many of the factors in both lists are contingent on characteristics of the individual who is showing up for The Work. For example, some of the helpful factors listed can be contingent on the individual’s state of mental health, internal locus of control, internal working model of security, ability to put up boundaries, healthy state of their will, ability to distinguish between human and spiritual developmental practices, their ability to not take things literally but use symbolism to alter mental perceptions, their ability to maintain perspective, to see the bigger picture, and to not see The Work as a panacea. And harmful aspects might come into play if the individual has a mental illness, a history of trauma, any other vulnerability, has a tendency towards guru worship, dysfunctional family background, etc. Even if a lot of an individual’s experience when going to a spiritual teacher has to do with what is going on inside of them, quite a lot of it has to do with what the spiritual teacher is doing as well. I think that any good spiritual teaching would have mechanisms in place to make sure that no harm comes to anyone, even the most vulnerable. Of course this is difficult to monitor, but at least an effort should be made in this direction. In a way, all the results of a guru’s teaching, even if unintended, are that guru’s karma. A guru should be making themselves aware of any negative effects they could have on others, and try to eliminate them, to clean up their karmic impact on other people as much as possible. I’ve been trying to stay as neutral as possible so far, but I think it’s OK to feel angry or upset if a guru personality goes around telling everyone they are “enlightened”, and then at the same time, they are actually harming people. 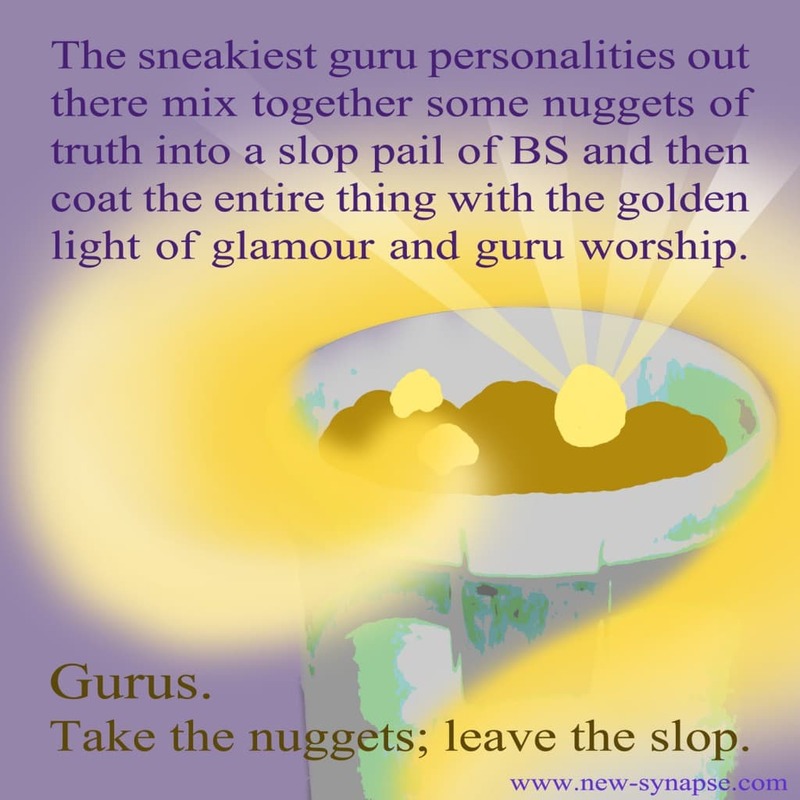 I know this is perhaps using strong language, but in my experience the most insidious spiritual gurus out there are those that mix together some nuggets of truth into a slop pail of BS and then coat the entire thing with the golden light of glamor and guru worship. The nuggets of wisdom, glamor and guru worship overshadow the slop pail of BS and nobody can perceive it. The Work is definitely not as bad as some out there! Byron Katie has some truly helpful teachings. At the same time, there are so many potential negatives there, I would definitely approach with caution and in an intelligent way. In the past I have benefited from The Work of Byron Katie, without a doubt, and I may actually read her books and listen to some of her videos again in the future in order to get the same benefits. But now that I have finished this analysis, I am aware of exactly how not to fall into any of the 37 potentially harmful traps. I will deliberately and consciously take only the nuggets of wisdom that will benefit me, and leave the rest. I came across a really interesting article criticizing The Work from the perspective of a Philosopher. The author, Morten Tolboll, examines The Work in a different way than I have. His emphasis is on thought distortions, of which he found a huge number in The Work. Tolboll actually did not find any positive aspects whatsoever, and skillfully clarifies how dangerous the Work is. At first I thought his analysis was a little too harsh, but the truth is the truth no matter what we may want to “believe” about it, or however we want to sugarcoat it. I now do not think any of the “benefits” I had perceived are necessarily from the Work itself but are most likely individual coping mechanisms such as wishful thinking and the like. Whatever they are, they are certainly not worth exposing your mind to the negative aspects. This kind of reading is very difficult for me due to the PTSD, but if I can force myself through it, it’s probably also very beneficial for my brain because I need to try to rehabilitate my thinking in as many ways as possible. “Such Ad Hoc clauses are not included in The Work. Remember Katie is quite consistent about doing the Work precisely as she is doing it; that is: don´t transform, remix or build upon it. “It is highly unlikely that a person doing the Work will be able to think so flexible as your ad hoc clauses would imply, and if the person did it, he or she wouldn’t be doing the Work correctly as Katie. “Many people who are coming with backfire critique to me are precisely patching up with their own private ad hoc clauses. Interesting. I think what he’s saying is that if you stay within the prescribed format of The Work, you would not be guided to experience any of these benefits necessarily. You would have to invent them within yourself as your own personal way to use what’s happening to you in a beneficial way. This means they are not part of the Work, they are part of you. If they were part of the Work, then they would be made explicit and transparent as actual goals of The Work. Instead there is a rigid format to follow and that format is generally what people will experience, because they are not encouraged to build and expand upon that format by Katie, and are rather encouraged to stick within the confines of the format. If you add things onto The Work that are not there and then believe they are part of the Work, they distort your perception of The Work, hence the name thought distortion. Since I was a SMART Recovery leader, I am familiar with the positives that are part of Albert Ellis’s Rational Emotive Behaviour Therapy (REBT), so perhaps it is easy for me to see things in The Work that are not necessarily actually there. For example, I was very sure doing the turn-around can help break down the ego defense mechanism of projection. But we have to look only at the way Katie does it and find out – only from her influence and not any additional knowledge – does it help with projection? Or is it just as crazy-making as the gaslighting of a narcissist? I don’t know. The only way to know would be to do a research study in my opinion. But the fact is The Work does not have it’s own conclusion to this question. While some may cope with a turn-around by reasoning that it is to help see their projections, others may lose their minds. The thing is, even if you were to benefit by confronting a projection, there are all these additional thought distortions going on, and reductionism and all, that I think Tolboll just sees it as a huge mess that overall is dangerous and in no way beneficial. Just the one thought distortion of Subjective Validation could distort people’s thoughts enough to be so detrimental that really nothing beneficial would result… If I understand it correctly, Subjective Validation removes the activity of making an Objective Validation of some kind of the Work, which means the individual has entered the situation already accepting the belief systems within it. This pre-acceptance sinks the individual’s own willpower in a sense. If nobody is acting from their own free thought and will then what appears beneficial may be just a belief that it is beneficial that was programmed from the leader and not a reality that can be measured. Thus, the belief in the benefit is actually a negative, not a positive. Tolboll points out “The Work doesn’t ‘work’ if the thought distortion Subjective validation isn’t active in the client; that is: the participants have already accepted The Work – they answer in the way Katie wants them to answer, and they play the role…” If they broke out of this at any point, the whole thing would come crumbling down. That is at least partially true for many, many religions and New Age groups. I don’t see it as 100% detrimental though, because subjective validation may legitimately lead to personal growth; it’s a shame that it exists but I don’t think you can say that nobody ever benefits in any tiny way while it exists. The thing is, why mess around with it when you can participate in a group philosophy that welcomes critical, free thought and honors truth, science, fruitful debate and the development of the sovereign, sound individual mind? A place where you are considered equal in essence to the “teacher,” and there is joyful pursuit of critical thinking skills and the democratization of knowledge? Tolboll’s article sheds light on what is going on not only with Byron Katie but with many New Age teachers and gurus. I highly recommend reading it; he does an excellent job. your post on AOL? I need a specialijst on this area to solve my problem.